Keith Roberts, left, chairman of United Residents Action Group, and members. 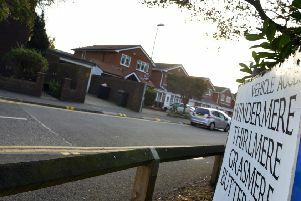 Residents at a supported housing complex are calling for action over anti-social behaviour which they say is blighting their lives. The group say trouble first flared at Porlock House, Low Simonside, Jarrow, around two years ago, after an increase in young people hanging around the area and suspected drugs activity. Keith Roberts, front, chairman of United Residents Action Group, and vice chairman Peter Emmerson. Their concerns have been reported to both South Tyneside Council and the police, but they say they feel nothing is being done about it. Resident Peter Emmerson said: “We have been to the police and the council’s anti-social behaviour department and nothing seems to be getting done. “We have kept records. We have kids on bikes hanging around and there is a strong smell of cannabis in the area. A spokesman for South Tyneside Homes said: “We know that anti-social behaviour is a concern for communities. “South Tyneside Homes and South Tyneside Council support Northumbria Police to investigate reported incidents and take any necessary action where there is evidence to do so. “This includes dealing with residents whose behaviour may be in breach of their tenancies. “Though investigations are ongoing in this particular area, residents are encouraged to continue reporting incidents, providing as much information as possible. Neighbourhood Inspector Denise Easdon of Northumbria Police said: “We are aware of concerns raised about anti-social behaviour in parts of Jarrow. “We appreciate the impact such behaviour can have on people, especially the more vulnerable members of our society. “We are fully committed to tackling these issues and ensuring everyone feels safe, and will continue to work with our partners to tackle all types of anti-social behaviour.